Pasta has come a long way since I was a child, especially in the last few years. There used to be limited options beyond typical durum wheat pasta. Possibly you could find whole wheat, but that was about it. Now there are so many choices including spelt, quinoa, brown rice, gluten-free blends, corn and, miraculously, grain-free. I have had all of the above and whereas I think they are all good, Cappello’s grain-free pasta recently blew my mind. My daughter was home for spring break and she bought some for dinner one night. 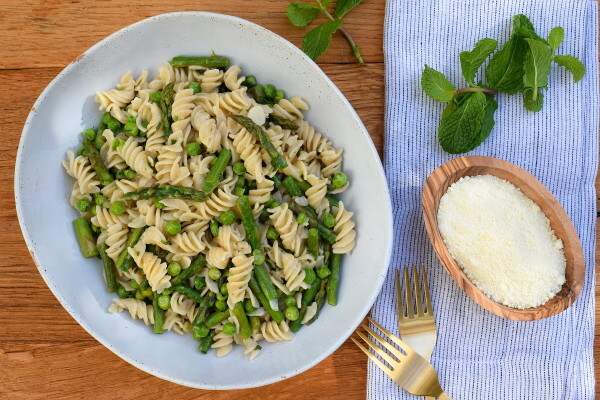 I’ll tell you the truth, I wouldn’t have even tried it because I would assume a grain-free pasta would be a mess plus it’s crazy expensive (I mean CRAZY.) But if you have to be grain-free, pasta is a food that you might kill for. Anyway, it was fantastic. Or maybe I just wanted to love it after I found out how much she spent. I grew up eating pasta 3-4 times per week. Monday it was often in a soup, Tuesday or Thursday was baked ziti, Friday was linguine aglio e olio, and Sunday was either ravioli or my grandmother’s homemade pasta with her sauce. We are Italian, so no one ever complained or thought it was strange that we ate so much of it. But now I consider pasta an occasional treat because I believe it is a processed food with a significant amount of carbohydrates. There is nothing wrong with complex carbohydrates, i.e. those paired with fiber and/or protein. Complex carbs, as opposed to simple carbs, are good for you and we need them for energy. But it is quite easy to overeat pasta, especially if you consider that a serving size is 1 cup of cooked pasta. Overeating carbohydrates is what gets us into trouble. When our blood sugar spikes, insulin is released to scoop it all up and let me repeat myself, insulin is a pro-inflammatory, fat-storage hormone. What’s the moral of this story? Don’t go crazy with pasta. Eat a small portion, and even better, stretch it out with lots of nutrient-dense vegetables. 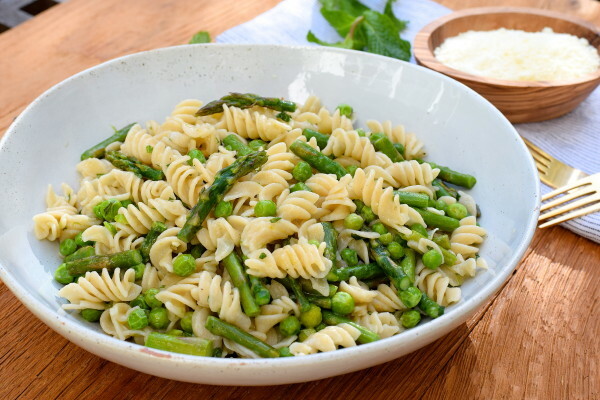 This is a lovely pasta recipe which utilizes the new spring produce coming out in the markets. I love the combination of asparagus, peas, mint and lemon. It’s so bright and fresh. According to Eating Well, asparagus is a very good source of fiber, folate, vitamins A, C, E and K, as well as chromium, a trace mineral that enhances the ability of insulin to transport glucose from the bloodstream into cells. Peas and grains make a complete protein, so if you wanted to serve this without any additional protein you could. My whole family, including the picky one, loves this pasta. I think this would be nice for Easter lunch with poultry, lamb or ham. It’s easy enough though that you could whip this up for a weeknight dinner, too. For those of you not eating pasta, the vegetable mixture is terrific mixed with cooked brown rice or quinoa. I have also added a leek to this recipe. Just clean it really well, thinly slice it and sauté it before adding asparagus. A handful or two of spinach leaves would also be delicious. Adding dark green leafies is never wrong. And a few toasted pine nuts would add some nice crunch, if desired. Why didn’t I write all these suggestions into the recipe? Because I know people don’t like recipes with a lot of ingredients. This dish tastes excellent as is written, but feel free to improvise. Whatever you do, don’t forget to save some pasta water before draining the pasta. That starchy, flavorful water is so valuable! It is the key ingredient to keep this from being dry, otherwise the inclination might be to add oil to the pasta to moisten it. If you are dairy-free, feel free to eliminate the cheese altogether, but do add a little extra salt. The pasta I used in these photos is Trader Joe’s gluten-free quinoa and brown rice fusilli. 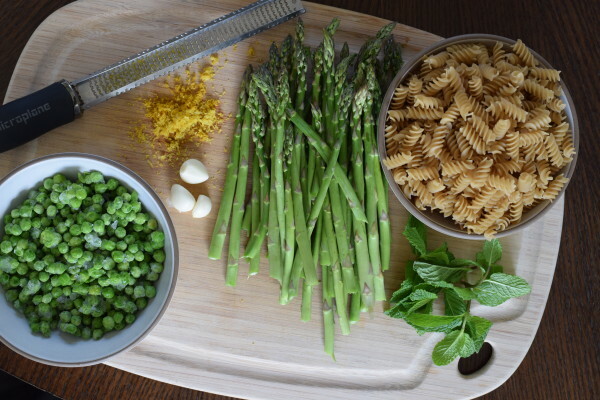 Check out this post here for how to perfectly cook gluten-free pasta! In a large skillet over medium heat, warm the olive oil. 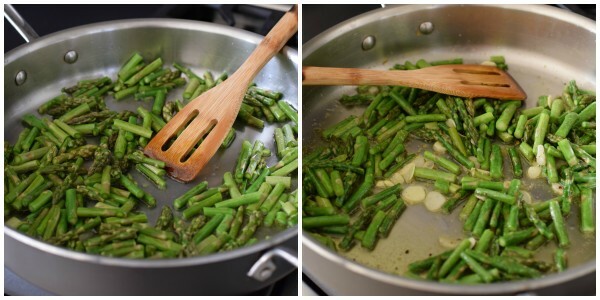 Add the asparagus and sauté, stirring, until tender, about 5 minutes. Stir in the lemon zest, garlic, red pepper, sea salt and pepper and sauté until garlic is fragrant to heat through, 1 minute. Set aside. Bring a large pot of water to a boil and add 1 tablespoon kosher salt. Add the pasta and cook until just before it reaches al dente. Remove 2 cups of the pasta water and set aside. Add the peas to the pasta pot and stir. 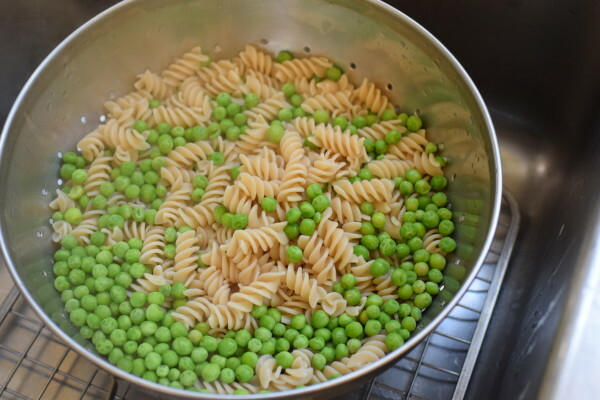 Drain pasta and peas. Return skillet to medium heat. 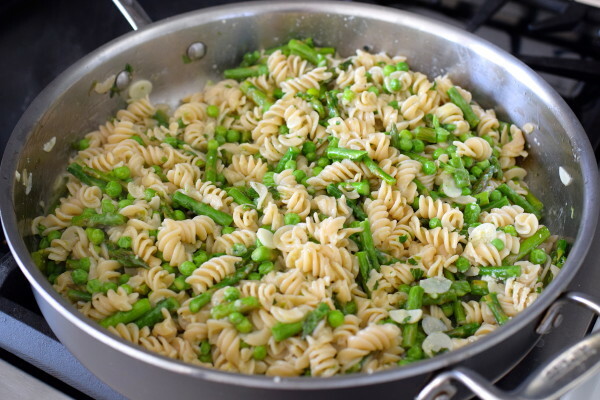 Transfer pasta and peas to the skillet with the mint. Add 1 cup reserved pasta water and stir everything to combine well. You may need a little more with gluten-free pasta. Simmer until pasta is al dente, about 3-5 minutes. Add additional pasta water if desired. Stir in butter and cheese and taste for seasoning. If you don't add cheese, you may need a little extra salt. In the summer, you can substitute chopped zucchini for half the asparagus. Halved cherry tomatoes are also nice sautéed with the vegetables. See my notes in the blog for other ways to change up this recipe. I have actually made the pasta for Easter dinner, also adding zucchini, onions/shallots, chives, scallions and parsley and basil. It’s very versatile, and I’ve also used artichoke hearts (frozen). Instead of pasta I have used farro or brown rice. You could also mix rice/vegetable combination with chicken broth for a spring soup. I hope I haven’t confused everyone! Enjoy your favorite mixture! Happy spring! Love your ideas for turning this into a soup! Thanks, Mia. Well, I just decided on a first course for Easter dinner! Thanks for all the other suggestions for making a really versatile dish. The various combinations of starches , vegetables and herbs can create a multitude of possibilities for your eating pleasure.